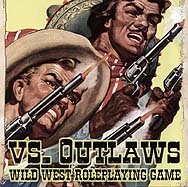 VS. Outlaws is the mini-RPG of adventure in the Old West the way we think we remember it, where tough hombres dispense two-fisted justice with barrels blazin'. This is a complete game. To play you will need pencils, paper, a deck of playing cards, and a fistful of friends. VS. Outlaws is for experienced roleplayers.